So as you know, I have been in full on ink mode lately. 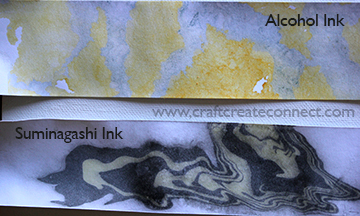 I received a question about alcohol ink floating since I mentioned that my suminagahi inks were floating. I thought hmmmm… they both do float… So what is the difference?! Inquiring minds want to know right?! So here is a little look at the difference! Both inks are totally cool in their own right. I guess just like any other medium, you have to decide what you are going for in your creation! Kim! that is really great video, I’ve never used the alcohol inks, looks like a great adventure!! Adventure is the word! You never know what you are going to get with the alcohol ink. But it is permanent on paper so awesome to use on mixed media stuff! Wow! Thanks for doing that! It really helped! It seems like the alcohol inks worked better with less water in your other video? I guess it’s to do with surface area? I will certainly have to have a play with them myself and see what happens 🙂 I’ll let you know how I get on! I’ve never heard of the other inks. I hadn’t heard of them either until about a week ago. Its a whole new something to play with now! Thanks for asking the question! No problem 🙂 It’s great fun experimenting with new products! I have been playing with my melting pot mostly! Thanks for this great video. Now my mind is swirling with possibilities. You’ve inspired me! I am so glad! You are very welcome!!! I know what you mean! I am sure you will figure it out and it will come out beautiful!